Tooth sensitivity can be quite uncomfortable. But the glancing pain you feel may be more than an irritation — it may also be telling you there’s a deeper problem that needs attention. As with other types of oral pain, tooth sensitivity can be a symptom for a variety of problems. Some of them are relatively minor, while others require immediate attention. It’s important to pay attention to the details about your tooth sensitivity and what they might be indicating you should do about it. For example, your teeth may be sensitive to hot or cold foods or beverages. 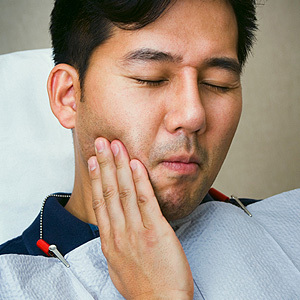 If it’s just a momentary pain it generally doesn’t mean an emergency — it could be a small area of decay on a tooth, a loose filling or an exposed root due to gum recession or overaggressive brushing. Besides seeing us for treatment for any decay, you can adjust your brushing habits to more gentle pressure with a soft-bristled brush. Fluoride toothpaste has also been shown to reduce this kind of sensitivity. If, however, the pain from hot or cold substances lingers, then decay or some form of trauma may have affected the pulp, the innermost layer of a tooth. The pulp is rich in nerve fibers and can become inflamed and irritated from the decay or injury. You should visit us as soon as possible: you may require a root canal treatment that will not only relieve the pain but also save the tooth. If you notice a sharp pain when biting down on food, it’s possible you have a loose filling or even a cracked tooth. As with inner decay, a fracture requires immediate attention. A loose filling should be easy to repair, but if it’s a fracture you may need extensive treatment to save the tooth or, if beyond salvage, have the tooth removed to make way for dental implant or similar restoration. The key point is not to delay seeking treatment, especially if the pain is persistent, severe or long-lasting. The sooner you visit us about your tooth sensitivity, the sooner you’ll have solutions to stop the discomfort.